It was Sinulog week and my sister is visiting Cebu for the first time. She had just graduated from college and by coincidence there was an airline seat sale. As a graduation present, I booked her a ticket so she can join me and my kid on our visit to Cebu. I'm no Cebuano but I've been there quite a lot in recent years, so I pretty much know where to bring first-time visitors. For her first day, we did a Cebu City Heritage Walking Tour! This walking tour was memorable to me because I got to play the tour guide and we did it with my then 2-year old kid in tow! The entire walking tour covers less than 2 kilometers of road, so this should be a piece of cake; no need to be fit or anything like that. From the place we were staying at in Mandaue, we took a taxi cab to Casa Gorordo Museum in Lopez Jaena St. Our fare was P105. Casa Gorordo Museum was the home of the first Filipino bishop in Cebu, Juan Gorordo. Inside, we saw some antiques, church memorabilia and more antiques. Photography was not allowed inside the turn-of-the-century-home-turned-museum, so we settled for outdoor pics instead. The entrance fee was P40 (adult). My sister was still technically a student then (she still hasn't 'marched'), so hers was P15 (college student). Hann got in for free. International guests would have to pay P70, HS students P10. We stayed there for about an hour. After rubbing our soles on the lovely bermuda grass and 50 failed jump-shots, we started on foot to the Yap-Sandiego house. It was just a few meters away but the midday sun beat down on us, so we couldn't resist buying some milky buko (coconut) juice from a peddler (P10 x 2). The Yap-Sandiego Ancestral House was filled with antique nick-knacks. Heck, the house is so antique, the entire structure creaks whenever somebody walked on its second floor! It's an exaggeration, but it's really in disrepair - really old. The entrance fee was P50 (adult) and P25 (student). Inside the pseudo-museum, one would have a good idea how the Cebuanos lived back in the days. The ancestral house is open at 9am-6pm daily. Our next stop was the Cebu Heritage Monument. It was located in a triangular lot right across the street. There's no entrance fee to this one, but as much as we wanted to stay longer, the sun got more fierce. Note to reader: you might want to bring a wide-brimmed hat or an umbrella when you do this walking tour of Cebu. We took some requisite shots and then we proceeded to our next stop at the oldest street in the Philippines - The Colon Obelisk at Colon Street. This marker, which also serves as a sundial, stands in the middle of a busy street so look out for it or you might miss it. Not feeling tired at all (chos), we troop to our next stop two blocks away: The Cebu Metropolitan Cathedral. Beside it is the Cathedral Museum which also houses religious relics and artifacts. I recommend that even non-Catholics visit the churches included in this itinerary because these are part of the Filipino heritage. Just a stone's throw away is the more famous Basilica Minore del Santo Nino de Cebu. The place was packed that day being only a few days before the annual Sinulog Festival (feast of Santo Nino, the Child Jesus). The main building is centuries old but still stands grand to this day. Colorful buntings add festivity to the church's usually solemn atmosphere. A short prayer, some requisite shots indoor and outdoor, and we were on our way to another famous landmark. The birth of Catholicism all started at this place, the Magellan's Cross. Ferdinand Magellan planted a wooden cross at this spot many, many moons ago. We've all seen it in books during grade school, but when we actually come face-to-face with it for the first time, my sister's reaction was the same as mine: "Ito na pala yun". But this is really a significant turning point in Philippine history, so that's that. Getting a little hungry now, we fuel up on some sugar (P10 x 2). When we finished, we ambled to the next destination in our itinerary: Plaza Independencia. The plaza was freshly renovated when we got there. It wasn't as clean and open the first time I went there. I was glad they polished this place up. My sister has been a good sport the entire day. We took turns carrying the little tot around. Sure he can walk, but he prefers to run around to places kids are not supposed to go. At the Plaza, we encounter a busload of students heading for our next stop. We decided to fall behind so we can have better (clear background) photos in Fort San Pedro. Fort San Pedro is like a miniature version of Manila's Intramuros. It's said to be the oldest standing triangular bastion in the country. The walls are made of coral stone and a small museum is housed inside. Some souvenir shops can also be found inside the fort, but we passed on those. No time for shopping - we were famished! Ahhh yes! Our last stop is at AA BBQ (Barbecue), a popular grill-style restaurant that turns into a watering hole at night. Food there is affordable and cooked upon order. We rested our tired leg muscles while feasting on grilled chorizo, pork liempo, scallop soup and seaweed salad. Yuuum! Our bill totaled P395. This entire itinerary took us around 4.5 hours to complete. And looking back at the Cebu City Tour Itinerary I drafted over three years ago, this one took more time. I'd say that is because of the additional destinations and the added effort in walking. Still, it's doable and most definitely worth it! 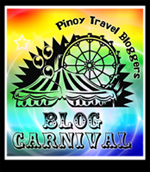 This is my contribution to the Pinoy Travel Bloggers Blog Carnival for October 2012 on the topic "Philippine Walking Tours" hosted by Glenn Martinez, the Traveler on Foot. i've only been inside the casa gorordo once! i had the same reaction when i first saw the magellan's cross too.